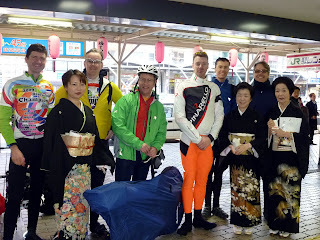 Rather than to add further writings about the Ekiden event, I post some of the pictures Ludwig and me took along the ride. Ok, I can not restrain myself and will add some comments nevertheless. This also should serve as a reminder when I plan the event next year again. It took me about 45 minutes from my house to the meeting point at Route 15 at the Tamagawa. The meeting point is easy to miss if you come from Tokyo as one has to leave the main road and ride down from the flyover. James and Dominic came shortly thereafter and as the Tokyo group was not in sight we started at 8:25. The first part is not so pleasant, I found. There is still a lot of traffic, many police on the streets and many red traffic lights. One is probably as fast as the runners on this stretch. We kept our group together, had some talks with the police here and there and then one of the spokes of my rear wheel decided to break. As I was organizing and perhaps a little bit more nervous than usual, one spoke missing made me even more nervous. The wheel was still true but I limited myself to about 40 km/hr on the downhills. We were late for the meeting point in Fujisawa but Kori has hold out there, so I was happy that this went well, after we have missed the Tokyo group or vice versa. After Fujisawa is there is a fast stretch on the coast road where we gained alot of time and where riding was fun with Fuji-san clearly visible right in front of us. Also Ludwig and David A caught up with us there. 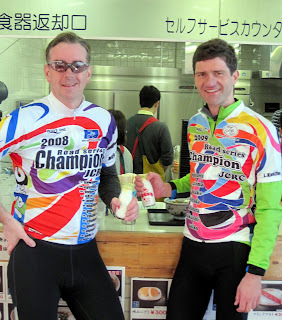 Then we all had together a last break an a Combini in Odawara before the serious portion of the ride started. Now Ludwig was also pushing to start, so I could relax a little bit from my organizing role. It was clear that we wouldn't stay together as a group on the climb from the beginning. I don't know why, but the road between Odawara and Moto-Hakone is not a very pleasant one. There is only a slightly incline, but it feels like 10%. And we almost got stopped by a policeman again, but Ludwig and me could ignore him and continue. We could also see another pair of pinchers from hell on the rights ide of the road, but they refrained from grabing us. At the beginning of the official Togebaka climb at Asahikawa Bridge, Ludwig, James and me were together with me leading and the others were somewhere behind. We stayed together for about 6 or 7 minutes and then Ludwig and James went ahead. David A also overtook me some minutes later. But that was it, I overtook some more riders on the way up. The traffic was rather bad with a lot of buses and sometimes I had to squeeze my way up between a bus and a line of spectators. One time I even had to stop. And I was slowly running out of power. 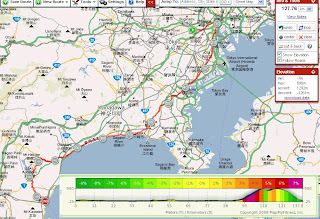 I particular dislike the slope after the Fujiya hotel which isn't that steep again, but for some reasons hard. Then I reached the huge Yunessun Onsen at about 600 m elevation and this is always the point on this climb where I think, OK I have almost made it and now it is only a few more meters. Some minutes later I was overtaking a struggling Japanese rider, I thought and shoute "Gambatte" as encouragement, only to find out that it was Graham. I wanted to be up fast, so we didn't talk too much and then I saw James taking a break at the roadside in front of me. Before he saw me, he started again and I could caught up with him. We then stayed together until the ENEOS gas station where he said "Oh, that was hard", while I said "It is not over yet! ", as we still needed to go down one hill and do one more short climb. 55 minutes an something was not a shabby time for me, better than last year (always important) and much better than the 1:35 hr I needed some years ago. Ludwig was by now already at the goal. 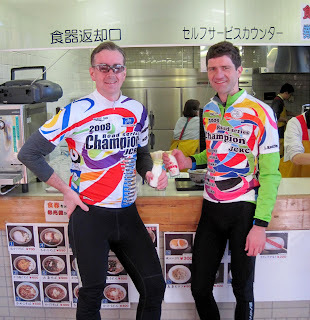 So James and me ride together into the finish area, seeing all the cheerleaders, hearing all the bands (Playing "Popeye, the sailorman") and watching the Supporters of Tokyo Nogyo Daigaku (Agricultural University) swinging big radishes in support for their team. I opted for the Assos Fugu jacket, which was the right choice for the first 20 minutes in the morning but was afterwards simply much too warm. Too cold was never an issue on this day. Luckily the day was sunny so I laid it upside down in the sun so that the sweat could dry. Dominic also made it in front of the runners, very well done. And Graham as well. 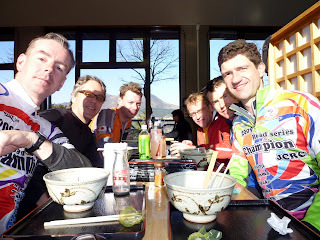 So after watching some of the runners, we rode up to the Michi no Eki restaurant where we had some Soba and Udon and told each other our stories. Ludwig and me wore our JCRC championship jerseys of 2008 and 2009 and we made some photos. 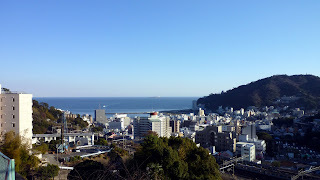 There was nobody elase coming so we made our way down to Atami. The traffic was bad up to Route 20, but from there onwards it was OK. The road was beautiful as usual, but I was very catious with me spokeless rear wheel so I didn't enjoyed it as much as I do normally. 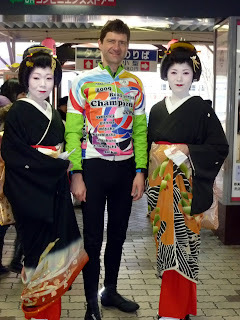 And in Atami we were greeted by an assortment of Geisha in the 60 - 96 years age bracket who congratulated Ludwig on his JCRC championship while all of us got there "Otoshidama" from them. Then back on the Shinkansen, very crowded but only 25 minutes to Shinyokohama for me with a beer in my hand. A very nice start into the 2010 riding season. I felt a little bit sorry about the rider we have left behind or didn't made it, so as some of the other have checked with Yair, I checked with Kori later. As we started also much more earlier the climb this year, than last year, there was also les stress that the runners would overto\ake our leading group. 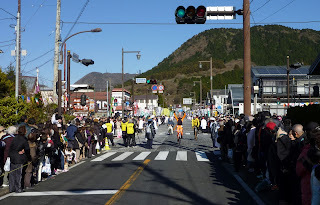 And of course we were faster but I would assume that the last runner of Toyo is stil faster on the stretch between Odawara and the finish than I was. Amazing.